Responding to increased demand for more premium pickups, the 2013 Toyota Tundra will offer last year’s CrewMax-only Platinum package as a stand-alone trim level across the lineup—allowing owners to enjoy additional lux amenities in both Regular and Double Cab configurations for the current model year. Also gaining expanded availability for the 2013 Toyota Tundra is the Rock Warrior package from TRD (Toyota Racing Development) and the Entune multimedia system with Display Navigation. The basics are these: Depending on exact model, the 2013 Toyota Tundra is available in Regular, Double and CrewMax cab styles, with a choice of three wheelbases, three bed lengths, three engine choices, five- and six-speed automatic transmissions, and rear- and all-wheel-drive. Shoppers can then fine-tune each configuration in one of three trim levels to meet their specific requirements. Tundra-grade trucks are set up on 18-inch steel wheels, with 4X4 models adding a standard limited slip differential, and all cabs boast plenty of interior storage, dual-zone air-conditioning with a dust and pollen filter, solar-energy-absorbing glass, power locks/windows, and an AM/FM/CD/MP3/WMA audio system with six speakers in Double Cab and CrewMax editions. The exterior of the 2013 Toyota Tundra shows off a two-piece front bumper in body color and chrome, set off by a chrome grille surround and rear bumper, with heated power-adjustable outside mirrors, front and rear mudguards in the mix as well. The 2013 Toyota Tundra Limited delivers a premium audio upgrade from JBL, including AM/GM/CD/MP3/WMA/USB playback, a three-month trial subscription to SiriusXM Radio, Bluetooth for hands-free calling and music streaming, and 10 to 12 speakers, with a subwoofer, depending on cab size. Comfort levels have been increased as well, thanks to heated and leather-trimmed power-adjustable front buckets seats—highlighted by a 10-way driver’s seat with power thigh and lumbar support. Leather accents also wrap up the Limited level’s multi-function steering wheel, while the dashboard is lit up by Optitron instrumentation. For a more distinctive, upgrade appearance, the 2013 Toyota Tundra Limited has been touched up on the outside, too: Standard fog lights, a matte-silver billet-style grille insert, power-folding chrome mirrors with integrated turn signals, and 18-inch alloy wheels. To further personalize the 2013 Toyota Tundra, a wide range of packages are available to supply appearance upgrades, high-value feature bundles, and up-rated off-road capabilities. The powertrain trio provided by the 2013 Toyota Tundra starts with a 4.0-liter V6 with dual independent variable valve timing and outputs of 270 horsepower and 278 lb.-ft. of torque. But two V8 options also are on the menu, including a 4.6-liter unit that makes 310 horsepower and 327 lb.-ft. of torque and a 5.7-liter engine that dials up 381 horsepower and 401 lb.-ft. of torque; both feature the Toyota intelligent valve-timing technology on display in the smaller unit. From transmission control comes two automatics for the 2013 Toyota Tundra, a five-speed transmission for the V6 and a six-speed for the other two choices. 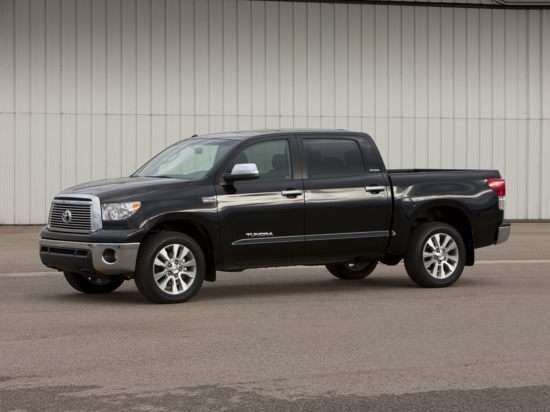 All cab configurations of the 2013 Toyota Tundra received 4-star overall safety scores in the New Car Assessment Program of the National Highway Traffic Safety Administration (NHTSA). The truck also is a Top Safety Pick of the Insurance Institute for Highway Safety (IIHS), based on crash-test performance in front, side, rear and rollover scenarios. The key tech advantage of the 2013 Toyota Tundra is its Display Navigation with Entune media system, which combines a 6.1-inch high-res touchscreen display (with split-screen capability), and AM/FM/CD/MP3/WMA/USB/SAT playback, HD Radio with iTunes Tagging, advanced voice recognition, and hands-free technology for both calling and audio streaming. As a final entertainment enhancement, the 2013 Toyota Tundra CrewMax, in Limited and Platinum trims, can be kitted out with rear-seat DVD entertainment system with nine-inch display, two wireless headphones and remote.